Written by the former inspector general of the Securities and Exchange Commission (SEC), Why Ponzi Schemes Work and How to Protect Yourself from Being Defrauded is the definitive account of the largest Ponzi schemes in history, as well as a comprehensive guide to protecting investors from frauds. The book provides specific and concrete tips on how to identify potential Ponzi schemes and how to get your money back if defrauded. Filled with fascinating stories from the author's investigations conducted while he was with the SEC, including his interview with Bernie Madoff in prison, this book provides a unique analysis of why Ponzi schemes are successful and why investors cannot rely solely on the government for protection. 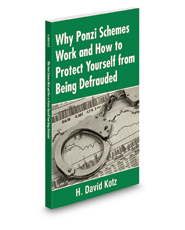 Why Ponzi Schemes Work and How to Protect Yourself from Being Defrauded is an invaluable resource and a must-read for all those who invest in capital markets.